Soft core in a hard shell - If TMT Bars had a tagline, this would be an apt one. TMT bar is an integral part of construction and it determines the strength and durability of a building. Most of us rummage shops after shops tirelessly looking for the best home decor stuff to adorn the interiors of our homes. How more choosy and smart should we be before buying TMT Bars for our construction purposes? Read ahead to have an idea about what a common man should know before buying TMT bars. 1. The TMT Bars’ Manufacturing Process. TMT bars are at their best when manufactured using the latest TMT technology. It is the best possible way by which TMT bars can be manufactured with strength and flexibility. Hence before you buy TMT bars for your construction purposes, make sure they are manufactured using the latest TMT technology. 2. Will it rust in peace? The capacity of the TMT Bars to resist corrosion is one of the inevitable factors that determine the durability and strength of your building. Since they are likely to be exposed to moist conditions, it is mandatory that you confirm that they are rust -resistant before buying TMT Bars. You wouldn’t want to see your building crumbling down after a flood or an earthquake. Would you? One of the parameters to consider while buying TMT bars is flexibility. High quality TMT steel like Fe 415 steel grade will withstand any amount of bending and is sure not to break or develop cracks even if bent at 90 degrees or even higher. Well even if doesn’t matter in academics, grade of steel do matter when it comes to buying TMT Bars. One of the main grades of TMT steel is Fe 415 grade steel, and it has proven to be more strong and durable. So before you fix the deal, remember to confirm which grade of steel it belongs to for the longevity of your building. 5. How far can it elongate? The longer, the better. Thus check how far the bars can stay elongated. For instance, Fe 415 grade steel has higher rate of elongation. This saves you a decent amount of money in the course of construction while ensuring that the bars last longer. WHAT ARE THE DIFFERENT TYPES OF TMT BARS? The TMT in TMT Bars stand for Thermo-Mechanically Treated, it is a process of rapidly cooling down bars in the molten state. This cooling down process is either done spraying water at regular intervals. This regular interval will further define the characteristics of the bars. This interval of quenching of bars will give rise to different grades of TMT bars in fact. The goal here is to have a solid and hard outer surface with a pliable inner core. This outer shell is coated with a protective film, making them resistant to corrosion and rust, making them apt for constructing sensitive structures such as high rise residential buildings and bridges in humid areas. 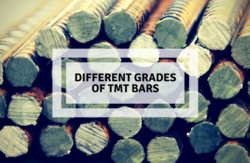 TMT bars and different Steel Grades. For starters, TMT bars are superior to conventional TOR steel bars. TMT bar grades are given grades according to their strength and rigidity. The higher grade, those TMT bars can be used for structures which require industrial grade strength. The higher the grade, the lessor the bendability so it is important to use them in structures where those things are not of importance. If Fe 600 is for industrial use, then Fe 415 is homes and residential structures. In the same way, Fe 500 and Fe 550 are versatile bars who can be used for building multiple structures such as bridges and underground structures. Fe – 415: Due to its higher uniform elongation, it is the choice of TMT bars for the common homeowner. This higher elongation makes them perfect for building structures in earthquake-prone areas. With the added advantage of anti-resistant coating, they are resistant to corrosion and rust as well. Fe – 500: A TMT bar which is known for its diverse usages, they have been used in bridges, multiple story commercial structures and underground structures. They are popularly used in coastal areas due to their anti-corrosion resistant properties. Fe – 550: a Little bit better than Fe 550, they are used where the scale of the project is slightly bigger for Fe 500 to handle. Fe – 600: Made for structures which require strength and toughness, this TMT bars is known for its high tensile strength more than anything else.